While Hunter boots are technically designed for sloshing around in the mud, they've earned themselves a gloss of cool-girl cred. Call it the sleek design, call it the iconic logo; blame the ankle-deep mud at music festivals for forcing so many celebrities to don the boot, or maybe just check out the Celebs Wearing Hunter Pinterest board; either way, there's always been rugged chicness to the boot. Rugged chic no more. 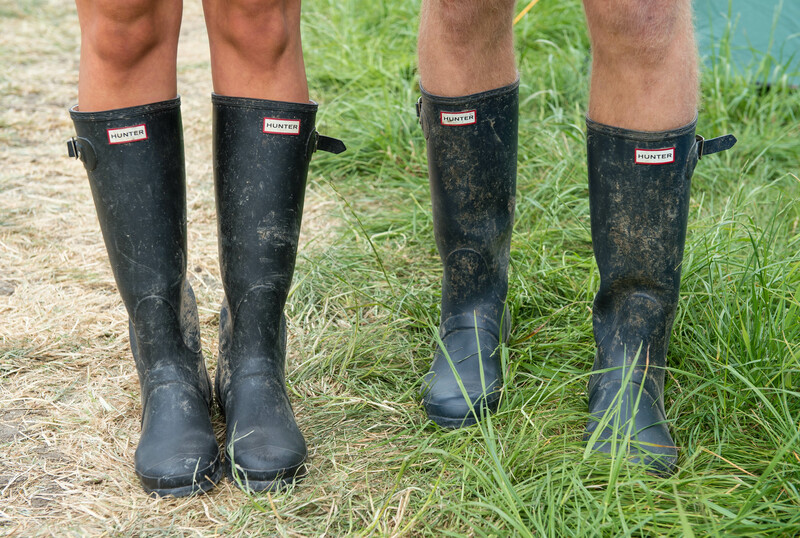 Hunter boots are ready to be taken as a serious fashion statement, muddy Coachella daze or no muddy Coachella daze. With new hires and a few significant changes on the horizon, the Hunter brand is positioning itself to be next in a long line of British "heritage labels," such as Burberry, Barbour, and Belstaff, who've made the successful leap from utilitarian garb to fashionable must-haves. Last year, Hunter snagged Alasdhair Willis (married to Stella McCartney) as their new creative director, and the former senior womenswear designer at Burberry Prorsum, Niall Sloan, as their new global design director. It's been almost a year since Willis was appointed, but we're just now starting to see the real changes — and they look bright, sassy, and a little sexier than we're used to seeing in a rain boot. Hunter's brand-new spring 2014 ad campaign, "Another Wet Summer," makes Hunter look, um, better than ever. The photographs cleverly pair the iconic boots with lots of bare leg and hot, sunny weather. Hunter boots: not just your bad weather go-to anymore, eh? An even bigger step for the brand will be Hunter's upcoming show at 2014 Fall London Fashion Week — a first for Hunter. This is Williams' big moment to reveal what he's been working on for the past year, as well as the brand's chance to finalize their utilitarian-to-fashion crossover. Hunter will be showing their Hunter Original Winter '14 collection, and you can expect a lot more than just boots from the show— you'll get to check out their new outerwear, knitwear, and accessories, too. The show happens February 15. Wait, who said anything about "just boots?"